As a NIMBioS postdoctoral fellow, Jiang Jiang (Ph.D. Biology, University of Miami, 2012) developed models that couple ecological-hydrologic processes to understand vulnerability of coastal ecosystems in response to global change. The models were used to investigate relative importance of internal positive feedbacks versus external environmental factors in coastal habitat changes, regime shifts of coastal vegetation, ecotone resilience, and plant community assemblies. 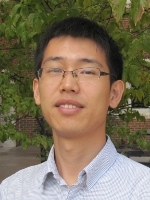 Upon completing his fellowship at NIMBioS, Dr. Jiang accepted a position as postdoctoral fellow in the Department of Ecology and Evolutionary Biology in University of Tennessee. For his new position, he is working on plant-mycorrhizal interactions and improving below-ground carbon degradation models. Gaoue OG, Ngonghala CN, Jiang J, Maud L. 2015. Towards a mechanistic understanding of the synergistic effects of harvesting timber and non-timber forest products. Methods in Ecology and Evolution. Jiang J. 27 January 2014. Modeling complex ecological dynamics. Invited Talk, Dept. of Biological Sciences, University of Texas, El Paso, El Paso, TX. Jiang J. 6 November 2013. Regime shift in a self-organized coastal wetland ecotone. 22nd Biennial Conference of the Coastal and Estuarine Research Federation, San Diego, CA. Beckmann C, Bloom J, Lambert J, Ward R, Ilany A, Jiang J. 2 August 2013. Modeling animal social network dynamics. REU 2013 Presentations, NIMBioS, Univ. of Tennessee, Knoxville, TN. Jiang J. 25 February 2013. Understanding ecological processes of species-environment interactions. Invited talk, South Florida Water Management District, West Palm Beach, FL. Jiang J. 18 September 2012. Modeling mangrove-hardwood hammock ecotone. NIMBioS Seminar Series, NIMBioS, University of Tennessee, Knoxville, TN. Our changing shoreline: Modeling the effects of storm surges on coastal vegetation. MPE2013.